I’m always a sucker for a good blogathon, and Ruth from FlixChatter has come up with a new idea that has taken the movie blogging community by storm. The concept? Shine a light on the ‘unsung heroes’ of a film — that being a supporting role or cameo that is often overlooked. After much debating about who I would highlight, I decided to take a look at a recent film that not many have seen: Sleepwalk With Me. Namely, the fantastic performance from Lauren Ambrose. One of this year’s biggest surprises, Sleepwalk With Me is a fun little film from the creative mind of comedian Mike Birbiglia. 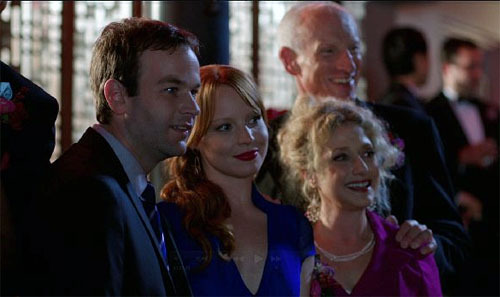 While Birbiglia, as Matt Pandamiglio, is (rightly) at the forefront of the film, the character of Abby, his long-time girlfriend (played by Ambrose), is crucial to his career development. Abby, and his relationship with her, both become frequent targets for Pandamiglio’s standup routines, and as he begins touring, the two of them drift apart. Although we are supposed to be on Pandamiglio’s side (as he even directly mentions in the film), it’s hard not to feel for Abby thanks to Ambrose’s endearing performance. The two characters have been dating for eight years. Matt is afraid of commitment, but Abby has steadfastly remained with him regardless. She is caring and supportive, even though Matt has spent the last few years floundering as a bartender. It’s clear that she is out of his league, but Ambrose presents Abby in a way that makes us actually believe that this slacker could be with her. Their relationship feels authentic, and anyone who has been with someone for a long time should be able to relate in some fashion. 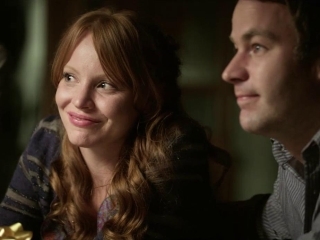 I was first impressed by Lauren Ambrose in the criminally underrated HBO series, Six Feet Under, and I am surprised to see that her film career is rather limited. After Six Feet Under, she joined two more TV shows — The Return of Jezebel James and Torchwood — while taking on more roles in indie flicks. Sleepwalk With Me is a definite highlight on her resume, and hopefully it introduces more fans to her phenomenal work. Not only is Ambrose stunningly beautiful, but she is a supremely talented and, much like Six Feet Under, sorely underrated. Head on over to FlixChatter for a look at the rest of the entries in the Small Roles, Big Performances blogathon. Nice write up! I really want to see that flick, thanks for the push. Glad to hear Ambrose is good in it. It’s a good one, man. A pretty light comedy with a couple of strong performances. Don’t know the movie, but it sounds like an interesting one to watch! It’s definitely worth looking up, Nostra. Will have to keep an eye out for an upcoming DVD release. Haven’t seen this film, but the performance you’ve spotlighted makes me want to see it. Thanks, Eric. Cheers, Michael. If you’re ever in the mood for a light-hearted comedy, keep this one in mind. Ahah, it doesn’t exactly take the movie blogging community by storm, but that’s very nice of you to say 🙂 I haven’t seen this movie but I have heard good things about Ambrose. I’ll have to check this out. Thanks for taking part Eric! Not seen this one, but Lauren really impressed in Six Feet Under. I wondered where she disappeared to after that show ended. Cool, didn’t know you were a Six Feet Under fan! If you enjoyed her in that show, you should seek out this movie. She’s great in this one. I’d watch this movie based on the title alone — that’s a great title. 😉 I’m adding it to my list. Excellent post! I haven’t seen much of Ambrose but by the sounds of things I better check out Sleewalk with Me…sounds interesting! It’s a good, light-hearted comedy. One of the more enjoyable ones I have seen this year.